Texas Gov. Rick Perry Wednesday called for a second special session of the Texas Legislature to reconsider an abortion bill that failed following a filibuster — cancelling the small victory the bill's opponents thought they had won following a marathon filibuster by a state senator Tuesday night. The new special session will start July 1 at 2 p.m. and will run for no more than 30 days. "I am calling the Legislature back into session because too much important work remains undone for the people of Texas," Perry said in a statement. "Through their duly elected representatives, the citizens of our state have made crystal clear their priorities for our great state. Texans value life and want to protect women and the unborn." 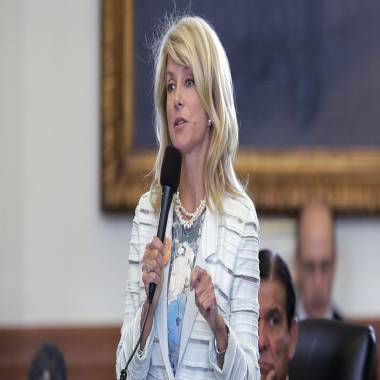 The move by Perry practically negates the effort of Wendy Davis, the Texas legislator who stood for 11 hours in pink sneakers on Tuesday night to filibuster the bill that would have set strict new abortion limits for the state. But Davis is a single mother and Harvard law grad who’s shown her grit before, and likely will again. Standing in front of a portrait of President Lyndon B. Johnson, Sen. Wendy Davis, D-Fort Worth, begins a filibuster in an effort to kill an abortion bill, on June 25, in Austin, Texas. The Fort Worth Democrat’s one-woman effort to talk down the measure placing stringent restrictions on abortion clinics was ended after state senators ruled that Davis had made three rules infractions, allowing them to break the filibuster. Abortion rights activists had said that Senate Bill 5 would have effectively put an end to the practice in the state of Texas. After Davis’ filibuster was ended late Tuesday night, legislators voted on the bill -- despite calls of protesters who tried to scream down the final 15 minutes of the special legislative session. Lt. Gov. David Dewhurst later acknowledged that the GOP-backed bill had missed its deadline. On Wednesday, Davis said she felt grateful. "I feel great today. I feel like the people of the state of Texas had a tremendous victory here last night," she told NBC's Chris Jansing. "Feet feel fine. Back's a little bit sore. My lower back was really hurting yesterday on the Senate floor as the hours wore on, but I got a few hours of sleep and I'm ready to go," Davis added. It was that resolve that won her the praise of many Texans. “Our community is thankful for Wendy Davis’ tenacity to fight for women’s health – her courage is recognized by women of Texas and her leadership reverberates across the country,” Stephanie Schriock, president of EMILY’s List, said in a statement on Tuesday. Davis said she was moved by the people who showed up to support her Tuesday night. "They were doing exactly what people in a democracy should do and I'm really proud of them," she said. "What happened yesterday showed the rest of the country that this is a place where people hold true to their value systems. And they are willing to come and exercise their voices when they feel that big government is intruding on their lives," Davis added. Nothing was certain for Democrats who wanted to squash the bill on Tuesday, but then, little about Davis' political career has been predictable. At age 19, Davis was divorced and a single mother, raising her daughter in a trailer park in Tarrant County. She took two years of community college courses before transferring to Texas Christian University, according to her state legislature profile. She became the first person in her family to graduate from college, and went on to Harvard Law School. Davis, now 50, served nine years on the Fort Worth City Council while practicing as an attorney, then resigned in 2008 to take on a Republican incumbent in the state’s 10th district. She won a hard-fought race against Kim Brimer, securing 49.9 percent of the vote. Texas Monthly Magazine named her “Rookie of the Year” after the 2009 legislative session. The race came after an effort by the state GOP to redraw the district and turn it redder, the Star-Tribune reported, requiring federal courts to step in. “Hopefully, this shows that when you take care of your constituents, they will reward you by returning you to office,” Davis said at an election watch party after successfully defending her seat, according to the Star-Telegram. Davis’ district of about 825,000 people is 47.4 percent black and Hispanic, and the number of single-parent families edges slightly above the state average, according to the most recent estimates from the Texas Legislative Council. Tuesday night’s fireworks were not Davis’ first time making a solo stand. Two years ago she drew national attention after mounting a filibuster against a proposal to make cuts to public education funds. Perhaps the former contender for the GOP presidential nod is just envious. The Texas Tribune reported that the joke among legislators and staffers under the dome of Texas’ Capitol building is that Davis is the only politician in the Lone Star state with a hairdo that outdoes that of the governor himself. Davis describes herself as a cyclist and runner, although she says she hasn't had much time for cycling since she's been in the Texas Senate. And her now famous pink shoes? "Those shoes that I had on yesterday during the filibuster were my running shoes that I grabbed and went out the door - sort of a last minute thought that maybe I might need something comfortable to wear while I was doing this," she said.